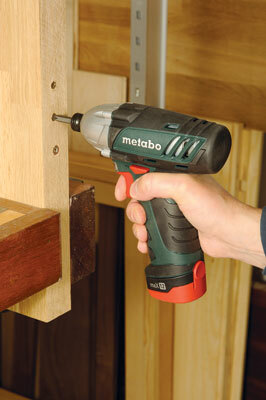 As 10.8s go this latest offering from Metabo is a bit on the chunky side. The grip is like that of a larger machine with all the usual rubber overmould, all rather necessary for an impact driver. require only 40 minutes to charge. Unlike other Metabo kit there's no power level indicator which I've found to be a useful feature on other models. An impact driver might have more appeal than you first think if you work in materials other than timber. The percussion mechanism is noticeable but not uncomfortable to use. The sensation is very much like using a drill driver with a clutch mechanism. Optimum tightening torque of your chosen fixing is achieved by controlling the duration of the impact function. A short burst for fixings into steel and a longer burst onto timber. I tried this repeatedly at the top end of the scale with some 5x70mm self-countersinking screws into a piece of oak. In a comparison test with a none-percussion machine the PowerImpact afforded greater control allowing the heads to finish flush without any pre-drilling. The bit remained firm in the screw head whereas the standard drill driver jumped on more than one occasion, damaging the screw. I have adjusted my perception of these tools as being solely for the pit-lane. It is possible for small screws to tighten without the impact function. 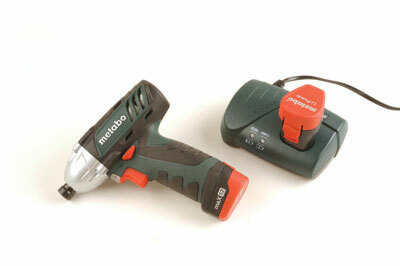 Like all recent Metabo drills, this cordless machine has an electronic protection system, designed to prolong the life of the cells and motor. All in all, a versatile addition to any tool kit.